The Albemarle Morris Men's answer to this question (from a flyer we used to hand out in the 1980's) is just a click away. 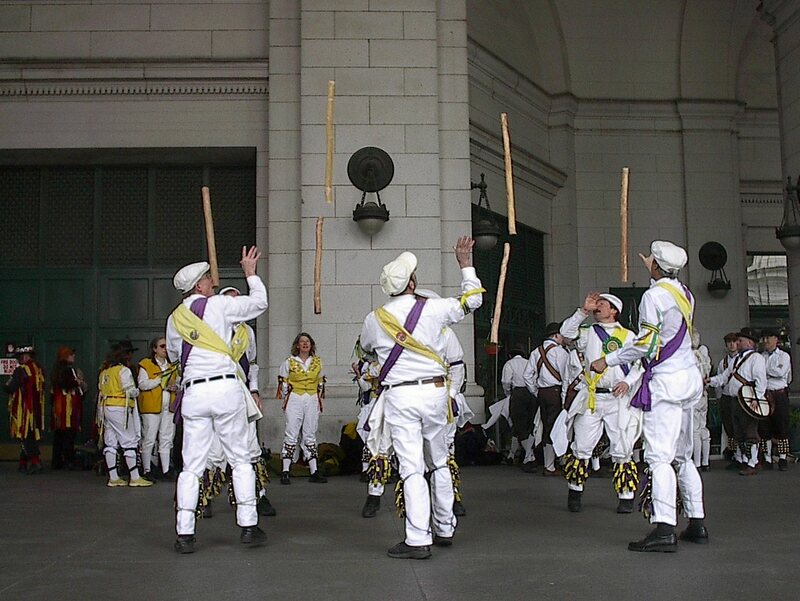 WhatIsMorrisDancing? 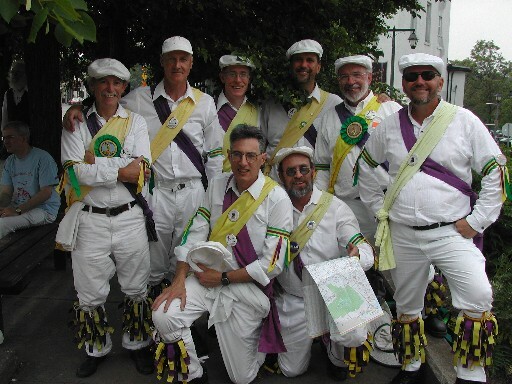 Every December the Albemarle Morris Men and a few other hearty men dance "traditional" Border Morris dances in celebration of the Winter Solstice. 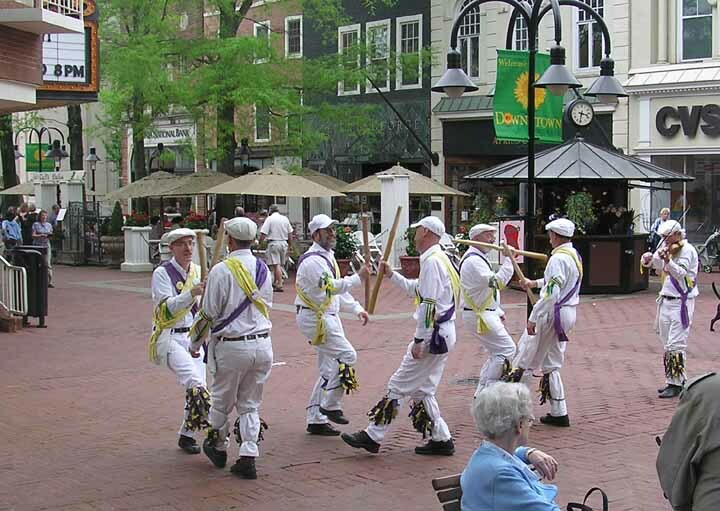 We dance the third Saturday in December every year (weather permitting) on the Charlottesville downtown mall from about noon until dark. We perform sets of about five dances at various locations on the downtown mall among the holiday vendors and other festivities. 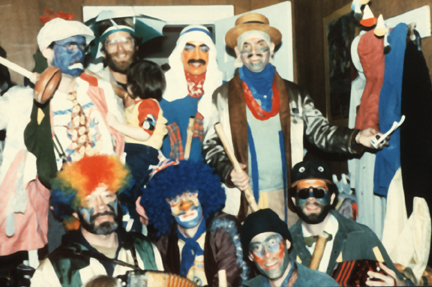 A photo of the Swan Tavern Border Morris Men from c. 1985 just prior to that year's dancing is given below. Listen for the sound of fiddle, Concertina, Melodeon, and Tambourine and look for dancers in blue jeans and tail coats (our current kits) - that will be us! 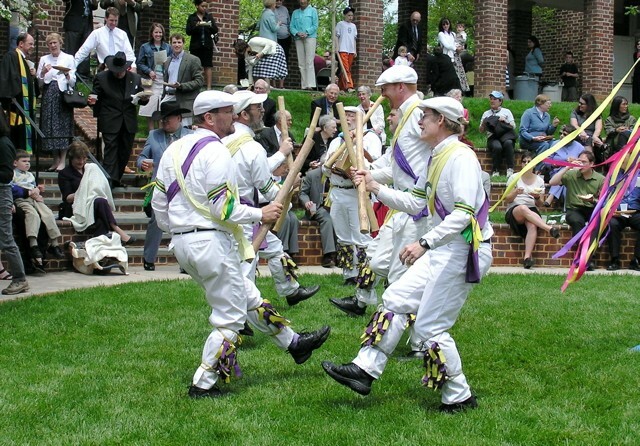 New dancers are welcome -- Contact Bill Davick (our Squire) or any of the Albemarle Morris Men for information on how you can get involved. Where might they be seen? NOTE: we meet for refreshment and conversation after practice at Rapture (303 East Main Street) starting about 8:45 pm. !!! Other Events To Be Announced - See NEWS at top of page for other possible events under consideration !! April, 2018 Richmond VA Easter Ale - hosted by More or Less Morris - Monument Avenue Easter Parade. Charlottesville Downtown Mall and sruuounding area breweries or wineries A weekend of dancing with out of town morris group from Richmond VA, Shepherdstown WV, greater Washington DC and beyond.